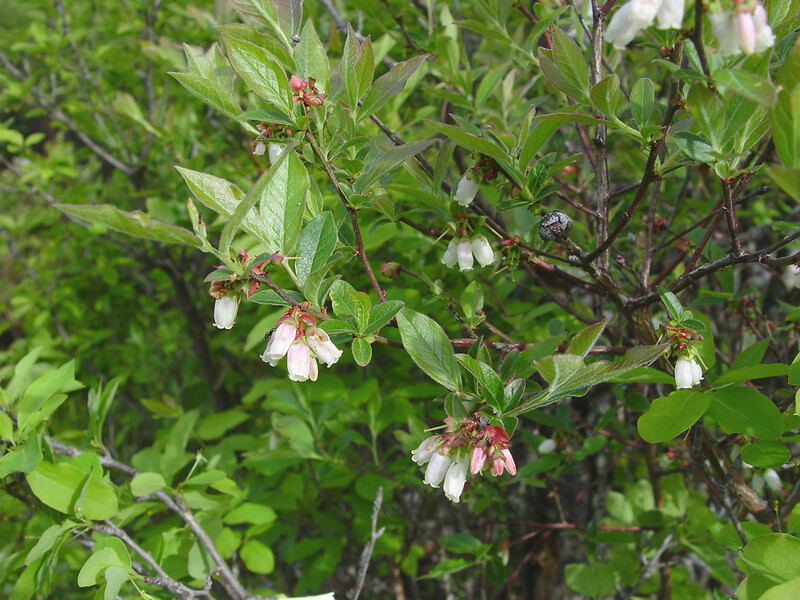 Vaccinium corymbosum. flowers and leaves.By Donald Cameron. Copyright © 2017 Donald Cameron.New England Wild Flower Society.gobotany.newenglandwild.org (Accessed 3/2017). Vaccinium corymbosum is a shrub 1-3 m tall, in clumps (crown-forming); roots associated with highly specialized ascomycota ericoid mycorrhizae, that increase nutrient uptake (Allen1991); stems angular, crooked, older bark gray, flaky, fibrous; twigs green to red. Leaves alternate, 3-8 cm long 1.5-4 cm wide, egg-shaped, often entire, often white-waxy below, sometimes hairy, fall color bright red; leaves expand early May; winter plant leafless 154 days (Britton 1874). Flowers white, urn-shaped 0.5-1 cm long, in small, branched clusters; blooms late April (Britton 1874). Vaccinium corymbosum. fruit and leaves.By John Lynch. Copyright © 2015 New England Wild Flower Society.gobotany.newenglandwild.org (Accessed 5/2015). Fruit fleshy, blue to black often with waxy bloom, about 1 cm; seeds tiny, 4-5; seed load 3%; pulp nutrient: water 84%, lipid <1%, protein 2%, CHO 85% (White 1989). Eaten by numerous birds and mammals (Martin et al. 1951). 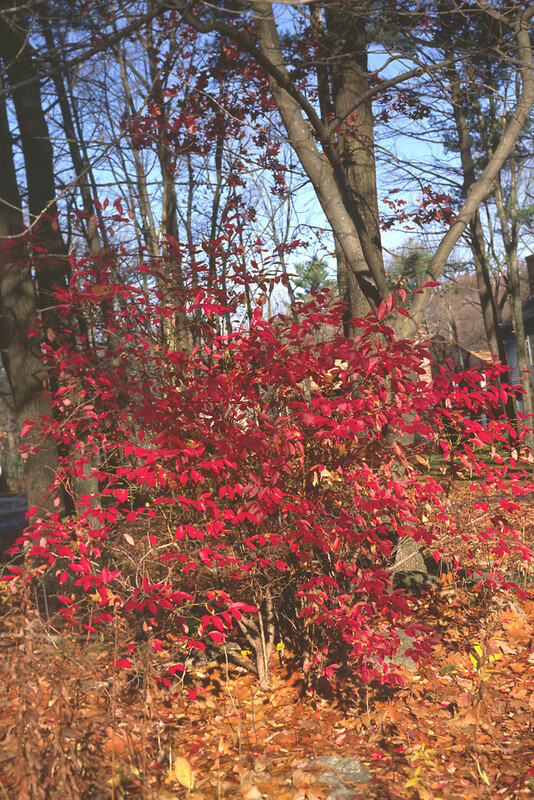 Vaccinium corymbosum.fall color.By Pennie Logemann. Copyright © 2015 New England Wild Flower Society.gobotany.newenglandwild.org. (Accessed 5/2015). Habitat: Moist to wet, acidic, or nutrient-poor acid, sandy soil, in undisturbed old fields, woods and swamp forests. Eventually declining under closed canopy forest. Often planted in wetland mitigations and restorations. Sometimes escaped from cultivation (Stalter and Lamont 2002). Tolerates soil pH 3.5-7.5 (USDA, NRCS 2010). Tolerant of flooding or saturated soil for up to 25% of growing season; shade (part or dappled); soil compaction. Moderately tolerant of salt; drought (Hightshoe 1988). Notes: Twigs eaten by deer, sprouts eaten by rabbits (Martin et al. 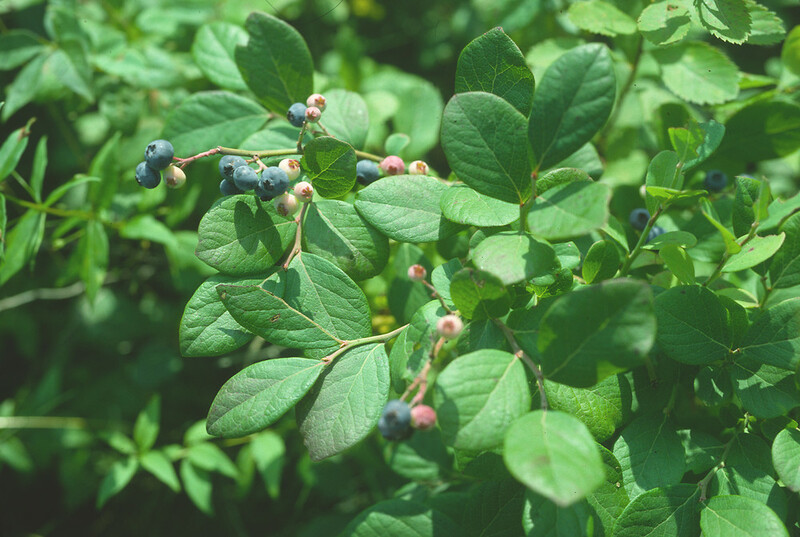 1951).Highbush blueberry is susceptible to a canker and dieback disease caused by the fungus Diaporthe vaccinii (Ascomycotina, Pyrenomycetes), (Agrios 1988; Sinclair et al. 1987). Grown commercially for fruit in suitable soils (NJ, MA, WI).